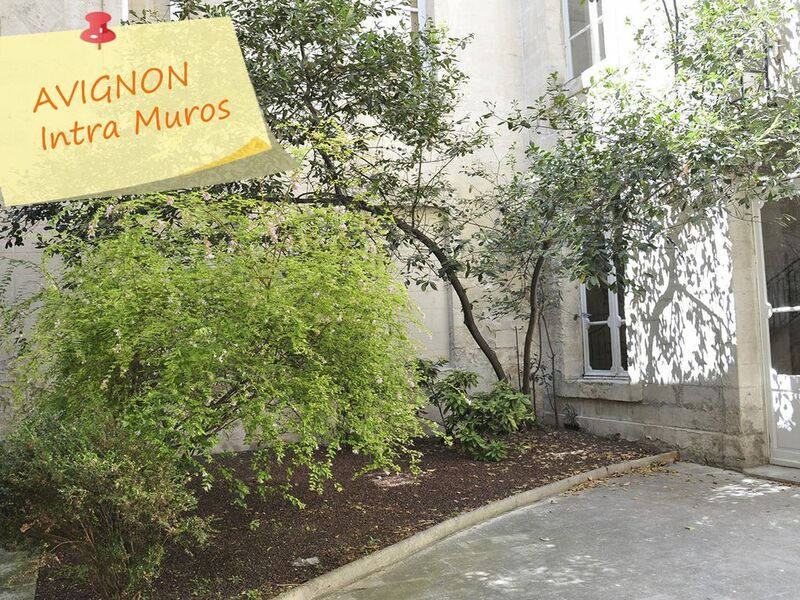 Apartment of 80 m2, located on the first floor of a building located intramural in the center of Avignon, facing the halls of Avignon. 2 minutes walk from the Palais des Papes, theaters (for the Avignon Festival), cinemas, tourist centers are within walking distance. All shops are nearby, the hall market is open every morning. The entrance to the parking hall is in front of the entrance of the building, you can also use a free parking with free shuttle that drops you 50m from the entrance of the building. The apartment includes: 2 bedrooms, 2 bathrooms, 2 toilets, fully equipped kitchen, lounge dining room. - washer / dryer, dishwasher, oven, microwave, fridge, freezer, toaster, coffee maker, electric kettle. The rooms: one with a bed 160 and one with 2 beds 90.
bathrooms: one with shower and sink and one with bath and washbasin. This apartment is so well located that it makes sightseeing a breeze. We walked everywhere. It is on an alley street (off the main drag), so it helps to cut down on the ever present Roman street noise. There was plenty of space for our family of 4, and the owner's graciously accomodated us on an early check out. Rome was a dream, thank you! One aspect that may affect you...the stairway is challenging. It is an old building with a steep spiral access. There are modern stairs to each of the lofts as well. It was not really a problem for us, but it is worth noting 😊�. We love our time at Bernard’s flat in Avignon. The two bedrooms and two baths were perfect for us. And the location simply could not be better! A great place to stay in the middle of Avignon. We found this apartment as described by previous tenants. The apartment itself is pleasant, roomy and fairly well equipped and when we arrived it was very clean. We enjoyed our stay. It is right in the middle of Avignon and therefore convenient for all amenities, especially the central market, which is opposite the front door, and bakeries and supermarkets and many excellent restaurants. The only significant drawback is that it is quite noisy late at night - seemingly because of a couple of local bars and their clientele. The noise is OK with the windows closed. Bernard was very helpful when we had questions in our halting French. Great location right behind the Halles but noisey at night from the nightclub on the corner, even with the windows closed. The apartment is great, but could use a good cleaning. Everything was dirty, floors, countertops, sinks, toilets and we cleaned it ourselves when we got there. If Bernard is trying to do it on his own he needs to hire a professional cleaner, because it could be a FANTASTIC rental. Owner does not speak any English so bring a phrasebook. Otherwise, we loved our week in Avignon. Je vous remercie pour vos critiques constructives. discuter avec les locataires me gêne beaucoup. ask a specialized company how to isolate the apartment. discuss with the tenants troubles me very much. We had a wonderful 12 days in Avignon. The appartment was exactly as described in the advert. Ideally located, in the heart of the Old Town, and opposite Les Halles, the most impressive market I've ever seen in France, with the most comprehensive range of food imaginable. The appartment was very well equipped, and very accessible, being on the 1st floor. I would have no hesitation in recommending this accommodation to friends and relatives. I would recommend this Apt.to any one.Spacious two bedroom,suites completely separate.It was very clean and the beds were very comfortable .Location was terrific. Les Halles,,The fresh market,is directly across the street.A car is not necessary .Anything you could ever want is within a 15 minute walk.We did have a car and the listing said it came with parking.It does not but there is a public garage attached to the market.If you do use the garage be aware that US.credit cards even with a chip are not excepted so be prepared with Euro coins.There are no change machines.The reason I gave it 4 stars rather than 5 is because it is very noisy at night.The streets are filled with people enjoying themselves and the deliveries for the market start at 4am. The windows are quite soundproof but have to be open when it is 90 degrees.All in all it was a great Apt. and I would stay again. Merci pour votre appréciation, j' espère que quand vous donnez une température de 90° dans l' appartement vous parlez de degrés Fahrenheit soit environ 30° Celsius, qui est une température estivale normale pour Avignon. J' espère sincèrement vous revoir à Avignon. L'appartement peut être loué pour plusieurs semaine (nous consulter). L'appartement peut être loué si vous assistez à des congrès (centre de congrès à 2mn à pied de l'appartement). L'appartement est disponible toute l'année - Pour des vacances. - Pour des congrès. - Pour des missions universitaires (Université à 2mn à pied) - Pour le plaisirs de visiter Avignon et son histoire.